As you may have heard, we love, love, love tacos. So we were very excited when we heard about a new taco place opening right here in London. It's by the owners of The Early Bird diner and it's right next door/attached. It's called Rock Au Taco (cute!). The shop itself has counter service, but you can order the tacos next door at The Early Bird too. We decided to order ALL of them! It's a tough life but we did it for research. Clockwise from the left, this is the Pescado (fish), Papa (potato) and Cachete (beef cheek). The Pescado had crispy fish, guacamole, slaw, radish and a creamy sauce. It was one of my favourites. The potato is a great vegetarian option with little cubes of fried potato, cheese and veggies. The beef cheek was so tender and delicious, I loved it. Then we had the other three options: clockwise from top left, that's the Bean, Lengua (beef tongue) and Panceta de Cerdo (pork belly). I didn't personally try the bean but it got great reviews. Another good choice for a vegetarian, but try the meat options if you can! The Lengua was great - tender with deep flavour. But our favourite was the pork belly. It came with a corn salsa and creamy sauce. The textures and flavours were fantastic. Matt likes things spicy and we were given 3 bottles of salsa to spice things up. We also tried the chips with guacamole and salsa. Plus, we had cocktails! They have a great selection of tequila and bourbon/whiskey based cocktails. We tried a grapefruit-tequila drink that was delicious. 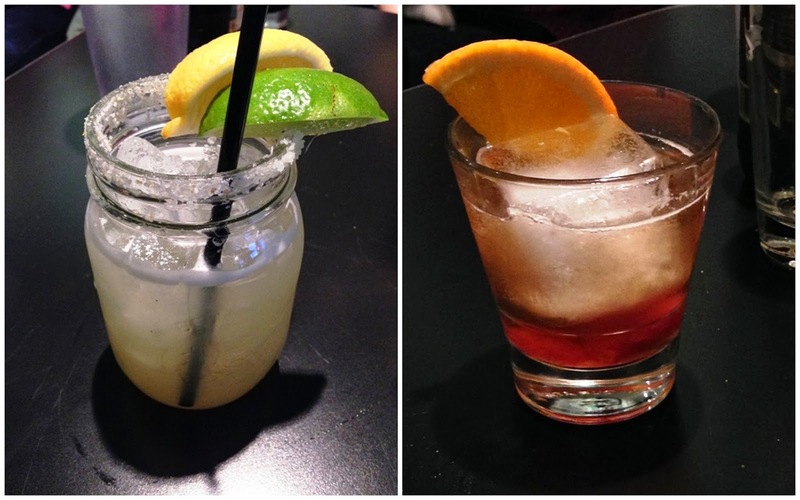 Plus we had margaritas made with spicy tequila, and a version of an old fashioned with marinated cherries. I love the huge ice cube! We plan to return often. It's a great place to grab lunch or a bite before a show. Check it out!